John from Glass Planet was GREAT and we're so thankful he was part of our wedding day! A couple weeks before the wedding, we met with him at the venue to get to know one another and discuss some aesthetic ideas. He immediately understood the parts of the wedding day that were most important to us and offered a number of helpful suggestions. On the wedding day itself, he was totally awesome... on his feet from hair and makeup in the morning all the way to dancing in the evening---a full 12 hours. He even snapped some still photos when friends of ours requested it. John captured all of the key moments of our wedding and put together a beautiful 3-4 minute highlight video within a matter of a few days! We've watched the highlight video like 20 times, and our friends/family just love it. Most importantly, John is a great guy---really nice, laid back, and easy to work with. He genuinely cared about us and doing everything he could to make our wedding perfect. We could not recommend him highly enough! I cannot say enough about how amazing John was! His prices are more than reasonable and his final product is amazing! I wasn't expecting to have our video less than two months after the wedding but he made it happen! John was professional and responsive up to the wedding and on the day of the wedding was on time and thorough. He even stayed 30 minutes later than we planned and had no issue with it! I wish I had more events that required a videographer, but instead I'll just recommend him to everyone I know. Highly, highly recommend! Thanks again, John! Above is a link to the amazing video John prepared of our wedding day. It really speaks for itself, but let me tell you a little bit about our experience of working with him. John was the best decision we made in regards to our wedding day (beside each other, of course!). From the moment we first contacted him about filming our day he was nothing but excited and receptive. He asked the questions that really allowed him to get to know what we wanted from our wedding day and he executed our vision flawlessly. I honestly cannot imagine the day running as smoothly without him and our photographer keeping things moving in the right direction. And I will say this, although John had never worked with my photographer before they made an amazing duo! I think that speaks endlessly to the amount of professionalism exhibited by John and his ability to adapt to just about any situation. I love our video and will cherish it until I can play it no longer. I am so extremely grateful to have been directed toward John for this service and I hope that you will hire him too! My husband and I wish John nothing but the best in his future endeavors, and we hope to cross paths again! We couldn't be happier with our films and the service we received from John! He is personable, responsive and professional, and seconding comments from other clients, the way he worked together with our photographer (never having met her before), you would have thought they worked together all of the time! He asked for and implemented our suggestions and our films turned out better than we could have imagined. In our search for a videographer, I watched a lot of films that could have been anyone's wedding film, but that is not the case with John. The time and effort he puts into making each film unique to the couple is evident, while still keeping his own style. My husband, who was skeptical about hiring a videographer, now says that was the best decision we made about our day...the cost is truly priceless! Our family and friends are in love with our films as well, and it is an amazing feeling to be able to relive our wedding day each time we watch our films! I'm not sure where to start because everything with John was so amazing! John is so talented and such a pleasure to work with. He is personable, kind, and put together such lovely/heartfelt/fun videos of our wedding. When we first received our videos, I think my husband and I watched each video 2-3 times, with huge grins on our faces! I am just so thankful we came across John and had the opportunity to work with him. He is just so great. If you are looking for an amazing videographer, who listens to you, and makes you feel comfortable (which is so important) look no further! Bonus points - upon meeting John, you'll [positively] want to be his friend. My now-husband and I booked Glass Planet Videography for our wedding this past August, and I have to say that I was completely blown away. I was planning my Albany wedding from out-of-state, and John was professional, kind, and helpful right from the first phone consultation. When we finally met him on our wedding day, John put each of us at ease instantly. He is a warm, and genuinely kind and caring person, which is evident in the beautiful work he produces. We knew immediately when we looked at Glass Planet's website, that John's work was exceptional and unique. The videos are romantic, beautifully crafted, and have a wonderful narrative quality. He has a very intuitive and artistic sensibility, and it is evident in the STUNNING videos that he creates. We have watched our video already more times than I can possibly count, and are utterly thrilled and in love with the results! John was so kind and wonderful to be around on our wedding day, and gave us an unbelievable, flawless result and series of beautiful videos that we will treasure forever. I highly recommend John for your wedding! Thank you John, for your incredible work!! My husband and I were absolutely BLOWN AWAY by our video footage. We watch our trailer all the time and call it "our favorite movie". John was extremely friendly, punctual, and professional. The amount of time and thought put into our video footage was evident. John was able to capture the essence of the best day of our lives, and put it together in a way that brings tears to our eyes. Friends, family, and even acquaintances have all made it a point to reach out to me and tell me how beautiful the wedding footage is. THANK YOU GLASS PLANET!!!!! I would recommend Glass Planet to any couple getting married!! John Glenn is so wonderful to work with and his work is beyond romantic and beautiful. Your wedding day goes by so fast and your video is so important as it helps you relive your special day over and over again and I am so grateful I came across Glass Planet Videography to capture our special day. My husband and I were so impressed with how John captured the rawness and elegance of our day and it is something we re-live every week by our breathtaking wedding video! Thank you Glass Planet!!!! 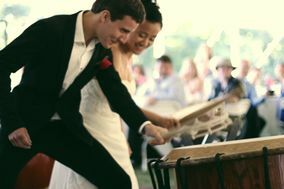 John worked with my sister's wedding in Saratoga last month, and we are just beaming from the incredible footage he took of the day. We literally cannot stop watching it. Video aside, he is a pleasure to work with, so accommodating, professional, and flexible. I still cannot figure out how he was able to be in so many places and get so many shots, one would think he was running around the wedding like a mad man, but we didn't notice him at all. Stealthy would be the operative word! He caught every moment throughout the day of importance and put it together with so much emotion that it is hard for us not to tear up when we watch the film. You can tell how much time he took to make sure he put it together effectively and chose just the right music to tell the story of the day. I could seriously write a book about how happy we are with Glass Planet Videography! I would say that John met our expectations AND surpassed them!! One thing I have to say is that at first, when we booked John, the groom was not sure that it was necessary to spend money on video for the wedding HOWEVER, after the wedding he was remarking about how it was all just a blur to him. Enter the video, which took all of those blurry moments and put them into focus into memories that he can now cherish forever. Thank you John for capturing all of Tara and Nicholas's special moments of the day so that they can remember them for years and years to come. You are truly talented, and we feel so blessed to have had the opportunity to work with you!! I had the most wonderful experience with John. My family and friends are crazy and wild to say the least and he took it all in stride. He was so easy to communicate with, and even having little to no conversations about style etc before the wedding he could just tell from the style of my ceremony exactly what I wanted. He was on time, so professional, didn't mind our silly comments, and I didn't even know he was there half the time. My video came out truly beautiful. My husband who was completely against having a videographer in the beginning( because we already had a photographer ), said having John was one of the best choices we ended up making. He said having John was a great idea!! ( I win! ) I highly recommend John and his services for all of your videography needs. He is truly wonderful and captured my special day in a way that is indescribable. I will be forever thankful! John was a dream to work with! He was great to talk to and knew what we wanted for our wedding and went above and beyond for us. Even got a drone (my husband's request) for some super amazing overhead shots. Couldn't of been happier and every time I show the highlight reel to someone, they tear up! Where to begin when reflecting on our absolutely outstanding experience with John at Glass Planet? I found John through some online research and from the moment I first spoke with him, I knew he and his style of videography were exactly what we were looking for. When he arrived at our venue, John was so kind and seemed genuinely excited to film our wedding. He captured our day in such a personal way with clips from speeches overlaid on perfect moments from the evening! We truly cannot say enough about how pleased we were with Glass Planet every step of the way. In fact, look out for a call from our recently engaged best man! John was absolutely amazing! His work is incredibly beautiful and thoughtful. The videos were not only great, but the turn-around time was very quickly! He was very very responsive, even more so than us. He was also very enthusiastic about working with us, which made it extra exciting and pleasant to work with. It was our pleasure to have him as a videographer. John's attention to detail and caring nature were very evident throughout the finished product. John clearly takes great pride in his craft and you will be hard pressed to find someone else this easy to work with. John was great to work with. He responded to all my emails promptly, and asked questions to clarify what I wanted to ensure the final product would be pleasing to me. He was very professional, flexible, and easy to work with. We received the video a week after the wedding and he even included a bonus intro and conclusion set to music. He is a very nice person and treated me like a human. other videographers I contacted when planning my wedding tried to rush me into signing a contract & never even asked me some of the questions John did as far as did I want the ceremony taped from multiple angles etc. You can tell he cares about his work and ensuring the client receives a product they are happy with. I would recommend glass planet videography with confidence to anyone looking for a videographer and will definitely use John again if I need any more filming in the future. I don't know if I got the chance to tell you, but thank you for your review and it was a pleasure to work with you!